Shares in US banking giant Bank of America dropped 6% after the bank announced a suspension of its capital plan due to an accounting error. In a statement, the bank said the error had to do with how it calculated losses relating to its acquisition of investment bank Merrill Lynch in 2009. 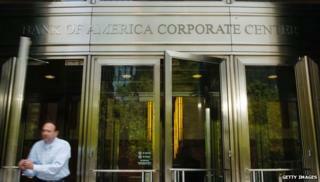 Bank of America had announced plans to buy back $4bn (£2.4bn) of its shares and boost its dividend. The US Federal Reserve said the bank would now have to suspend that plan. Bank of America has 30 days to submit a corrected balance sheet, as well as a new capital plan, subject to approval of the US central bank, the Fed said in a statement. Bank of America recently reported a $276m (£165m) loss as a result of more than $6bn in legal expenses it paid to settle allegations that it misled mortgage lenders Fannie Mae and Freddie Mac before the housing crisis in 2008, as well as for other mortgage-related matters. The US Federal Reserve requires large banks to submit their balance sheets and capital plans to ensure that they can pass so-called "stress tests", should another banking crisis materialise. Bank of America said the adjustments relating to the value of the securities it now controls as a result of its purchase of Merrill Lynch will not force it to restate its first quarter earnings. The bank said that even with the adjustments, it still had enough capital on hand to pass the Fed's test. Last month, Citigroup was the biggest US bank to fail the Fed's test, after the central bank cited concerns about Citigroup's internal controls.